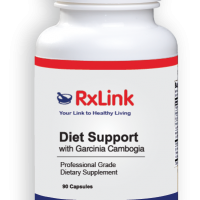 RxLink Black Cohosh is an herb that provides a natural way to normalize hormonal changes and moderate the uncomfortable changes that accompany menopause. Wellness Works Black Cohosh is made under strict European quality standards which are comparable to over-the-counter drug standards in the U.S. It provides optimal levels of naturally occurring triterpene glycosides. 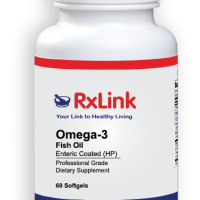 RxLink Black Cohosh is an herb that provides a natural way to normalize hormonal changes and moderate the uncomfortable changes that accompany menopause. 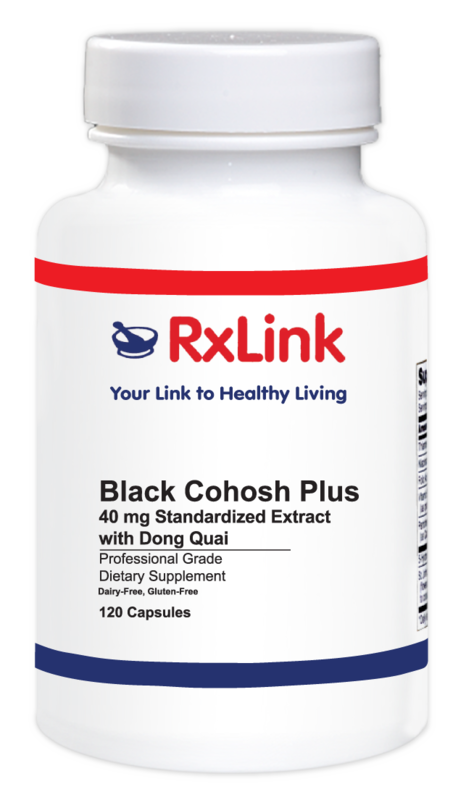 RxLink Black Cohosh is made under strict European quality standards which are comparable to over-the-counter drug standards in the U.S. It provides optimal levels of naturally occurring triterpene glycosides. Rxlink Black Cohosh has traditionally been used to help alleviate perimenopausal and postmenopausal symptoms and the German Commission E supports its use as such. The mechanism of action is still unclear but it is thought to have an estrogen-like effect or modulate estrogen receptors. 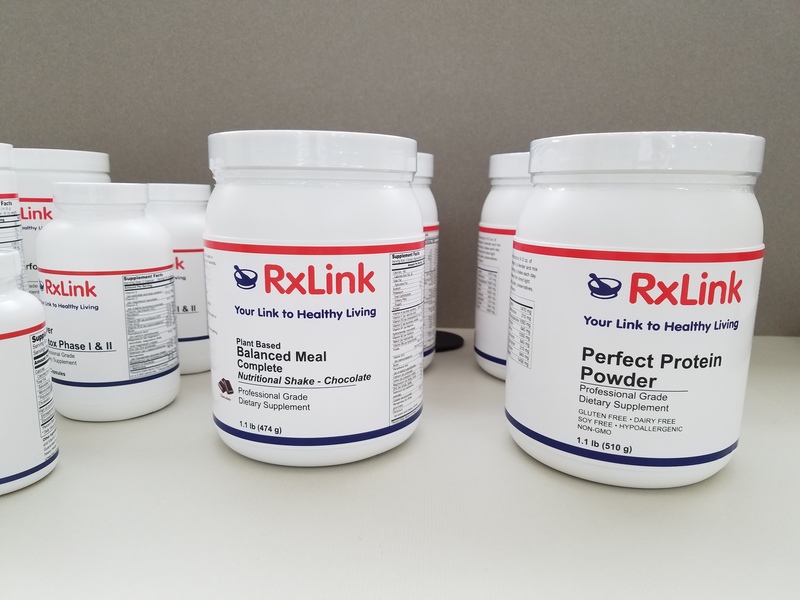 Although more research is needed, RxLink black cohosh may help support normal, healthy levels of luteinizing hormone (LH). Increased LH levels, which is often the result of declining estrogen levels, are typically responsible for the changes associated with menopause. Studies showing a positive effect for symptoms of perimenopause and postmenopause have used primarily extracts standardized to contain triterpene glycosides. Dong quai is added as it helps support a normal, healthy response to female hormone imbalance. Chasteberry helps support normal, healthy levels of lutenizing hormone (LH) and prolactin. By doing this, chasteberry can help provide support for symptoms associated with menopause. 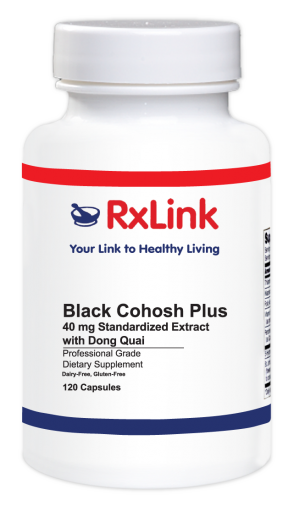 RxLink Black Cohosh may be an effective way to help support perimenopausal and postmenopausal women, particularly for those with intolerance or contraindications to traditional hormone replacement therapy. 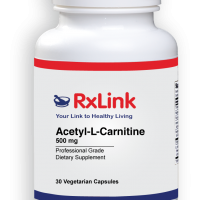 Adults take 1 capsule, 4 times daily with meals or as directed by a healthcare professional. Other Ingredients: gelatin, water (capsule), rice powder, magnesium stearate, and silica. Foster S. Black cohosh (Cimicifuga racemosa): a literature review. Herbalgram 1999;45:35-49. Kruse SO, Lohning A, Pauli GF, et al. Fukiic and piscidic acid esters from the rhizome of Cimicifuga racemosa and the in vitro estro- genic activity of fukinolic acid. Planta Med 1999;65:763-764. Liu J, Burdette JE, Xu H, et al. Evaluation of estrogenic activity of plant extracts for the potential treatment of menopausal symptoms. J Agric Food Chem 2001;49:2472-2479. Düker EM, Kopanski L, Jarry H, Wuttke W: Effects of extracts from Cimicifuga racemosa on gonadotropin release in menopausal women and ovariectomized rats. Planta Medica 57: 420-424, 1991. Winterhoff H, Butterweck V, Jarry H, Wuttke W. Pharmacologic and clinical studies using Cimicifuga racemosa in climacteric com- plaints. Wien Med Wochenschr 2002;152:360- 363. Jacobson JS, Troxel AB, Evans J, et al. Randomized trial of black cohosh for the treatment of hot flashes among women with a history of breast cancer. J Clin Oncol 2001;19:2739-2745. Burke BE, Olson RD, Cusack BJ. Random- ized, controlled trial of phytoestrogen in the prophylactic treatment of menstrual migraine. Biomed Pharmacother 2002;56:283-288. Bodinet C, Freudenstein J. Influence of Cimicifuga racemosa on the proliferation of estrogen receptor-positive human breast cancer cells. Breast Cancer Res Treat 2002;76:1-10. Merz, PG; Gorkow C, Schrödter A, Rietbrock S, Sieder C, Loew D, DericksTan JS, Taubert HD (1996). “The effects of a special Agnus castus extract (BP1095E1) on prolactin secretion in healthy male subjects”. Exp Clin Endocrinol Diabetes 04 (6): 447–53.